An End-to-End Integrated Solution for Complete Operational Efficiency. 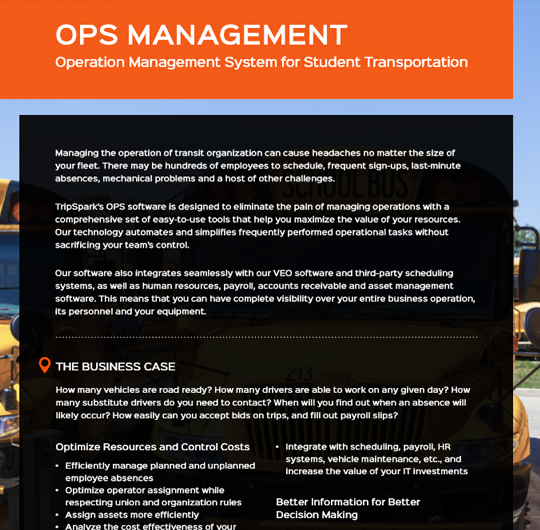 The safest and most efficient way to securely transport students is to have a complete overview of your school transportation operation. 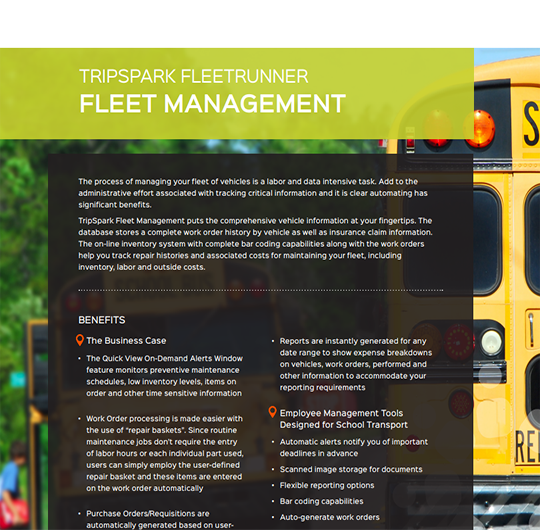 With over 30 years experience, TripSpark's K-12 school bus transportation software solutions suite has been specifically designed for the complex school transportation environment and features a unique multi-calendar interface. We are proud to have been selected by more than 50% of the largest school districts in North America and currently transport 1.8 million students with 50,000 buses. 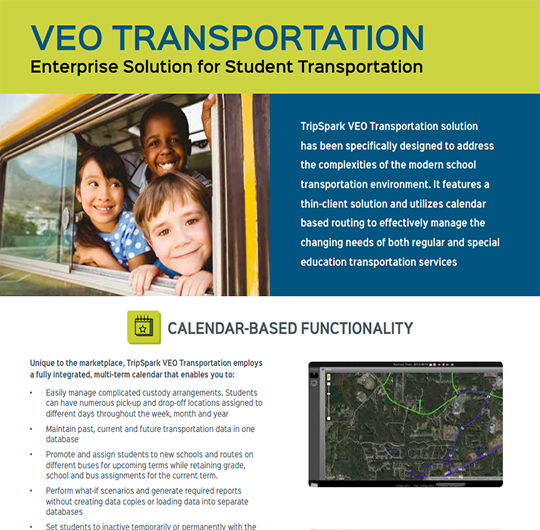 Read on to learn more about our calendar-based scheduling / routing, GPS tracking, student tracking, parent mobile apps, bus driver management, field trip management and more. 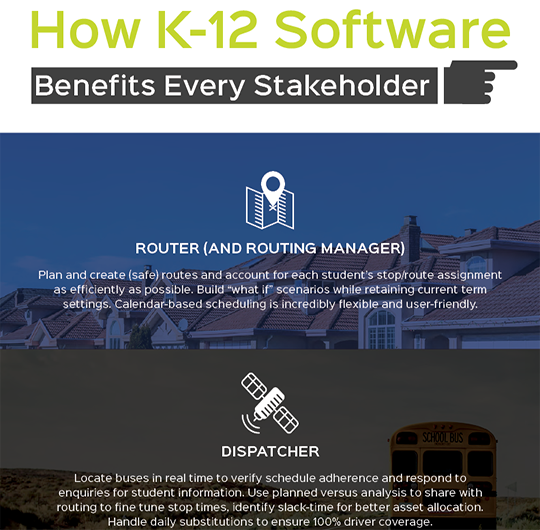 Watch our overview video to learn how K-12 transportation technology makes scheduling easier while also providing safer transportation for your students. A single vendor, end-to-end solution ensures your system functions seamlessly and that you’ll always have the vital information you need to respond to parents and teachers. Build optimal routes to eliminate inefficiency. Calendar-based schedule manages large amounts of data with ease, allowing for quick trip creation, editing and planning. Plan for current and future semesters with multiple "what if" scenarios. AVL services track and monitor the movements and locations of every bus on the road. Complete insight into the location of students on their routes with RFID student tracking cards. This is essential information for parents and staff. Software efficiencies encourage driver retention rates and make it easier for drivers to bid on certain trips. Determine schedules based on seniority and all trips connect with payroll software to streamline payment process. Make edits to a student's routing to accommodate a one-time change. Set student as on vacation to suspend service for a specific duration, rather than having to build an entirely new schedule. GPS data analysis ensures that pre-designated optimal and safe routes are followed by drivers. Drivers access in-vehicle maps of your planned routes and not generic Google maps that can't display your actual plan. Improve special education service levels by ensuring routes are optimized, reducing on-board times, and easily manage Medicaid reimbursements and student data regarding eligibility. More power and insight into each students’ unique transportation needs. GPS data-driven tracking allows for pinpoint accuracy ensuring student safety. Know when and where your child will arrive. 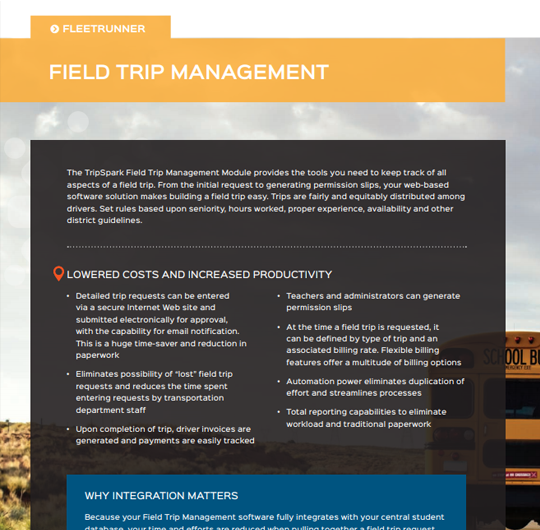 Complete tracking of field trips from permission slips to driver invoices. Allowing you to monitor the condition of your buses and drivers in your fleet. Red Clay was able to reduce their number of school buses through better routing and improve their professionalism because they were equipped to handle parent's inquiries quickly and accurately. Kelly Shahan, Transportation Manager at Red Clay Consolidated School District, speaks to us about her experience with VEO Now. The Billion Dollar Question: Is Transit Worth The Big Spend?